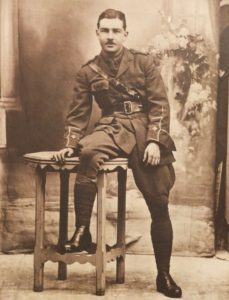 Alexander Cecil Birss was one of the 846 men killed at Bellevue Spur, Passchendaele, on the morning of 12 October 1917. He was 21, a Second Lieutenant of the 2nd Battalion, 3rd NZ Rifle Brigade. Cecil was born in Blenheim in 1896, the first of four children born to Gertrude and Alex Birss, later of Hamilton. He was a law clerk in Wanganui when he enlisted in September 1915. He sailed from New Zealand in December that year. He was wounded in France in September 1916 and sent to Brockenhurst Hospital in the New Forest, Hampshire to recuperate. Many of his countrymen spent time there while they recovered, only to return later, as he did, to the battlefields of France and Belgium. Cecil continued his service and fought until his death at Passchendaele on New Zealand’s worst day of any war. He wrote a letter to his younger sister Thelma only six weeks before he died. The letter survives and is currently on display at the Passchendaele exhibition in Wellington. In it, Cecil writes: “As I sit here in my dugout, the Boche is strafing all around but so far he has not hit my ‘bivvy’. If he should, I am afraid it would finish it”. Cecil’s body was not recovered, one of the great many still lying in Flanders Fields. He is remembered at Tyne Cot Cemetery, panel 7.